his section of the guide covers south-western France. A number of the regions in the south-west are close neighbours of Bordeaux and the style inevitably mirrors that of the Bordelais. Further south, both in the Lot Valley at Cahors and south towards the Pyrenees at Madiran and Jurançon, first-class dry and sweet whites and rich, stylish reds are becoming justifiably known to a wider audience. Immediately to the east of Bordeaux on the river Dordogne is Bergerac. There are a number of ACs north and south of the river, but the large, generic Bergerac AC encompasses all the smaller subregions. Red, white and rosé are produced from the Bordeaux varieties. Quality is fairly pedestrian with high yields and widespread mechanical harvesting. The number of good reds and whites being produced here is, however, increasing. Lees-enrichment and bâtonnage are now being used for whites and new oak is increasingly common for both reds and whites. The Côtes de Bergerac and Pécharmant are immediately to the north of the town of Bergerac. The former is a source of some good reds and sweet whites (labelled as Côtes de Bergerac Moelleux). Pécharmant should do better than it does with its well-drained sandy, limestone soils. To the south of the river are the sweet-white ACs of Monbazillac and Saussignac. The former is worth considering as an alternative to Sauternes. The wines can be remarkably rich and complex with heady levels of botrytis. Be aware though that they are becoming more established and prices are rising. Both ACs are a blend of Sémillon and Sauvignon Blanc. Some good red and dry white is made at Montravel in vineyards bordering the Côtes de Castillon in Bordeaux. Sweet styles are also produced here and in the small ACs of Côtes de Montravel and Haut-Montravel. Thus far they lack the richness and depth found in Monbazillac. South of Bergerac are the appellations of the Côtes de Duras, Côtes du Marmandais and Buzet. Both red and white are produced in the vineyards around Duras, with an occasional late-harvest white. As at Bergerac, Bordeaux varieties are planted. The reds tend towards a vegetal character and the whites are at best fresh and grassy. More new oak is being used, with varying success. 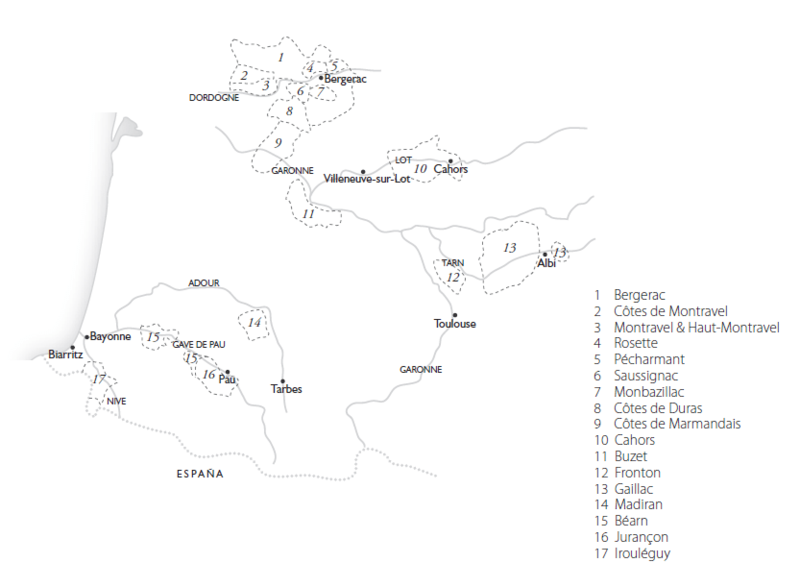 Marmandais and Buzet appellations are red only, with more interest in the Côtes du Marmandais, where as well as Bordeaux grapes some indigenous south-western varieties are also permitted. To the south-east of Bergerac along a 30-mile stretch of the river Lot are the vineyards of Cahors. Some of the finest red wines of the south-west are now produced here. Auxerrois (Malbec) dominates plantings, with some Merlot and Tannat. Expect anything from light, plummy, easy-drinking wines (occasionally with a green vegetal note) to serious and very structured ageworthy reds. Prices of the best examples seem to be surging upwards. West of Cahors the AC of Marcillac produces spicy reds from Fer-Servadou, while to the south the AC of the Côteaux du Quercy produces reds of some potential. Further south, towards Toulouse, are the appellations of Côtes du Brulhois as well as Lavilledieu; and Fronton. The latter has turned out a number of interesting reds based on the Negrette grape. The wines are both perfumed and spicy, the best impressively structured. To the north-east of Toulouse, Gaillac AC offers some unusual and diverse styles; Mauzac is the key white variety, although Muscadelle is also important. Good dry and sweet wines are produced along with perlé (a lightly sparkling white) and Gaillac Mousseux, produced by the méthode rural. The majority of the red is light although there are significant examples. To the south are the great red and white wines of Gascony. This is also bulk white IGP des Côtes de Gasgogne country. The Madiran and Pacherenc du Vic-Bilh ACs share the same geographical area and many growers produce both. Pacherenc can be dry or sweet and is produced from Gros and Petit Manseng, Petit Courbu and Arrufiac, with the odd touch of Sémillon and Sauvignon Blanc (for moelleux) blended in. The best are very good. Madiran itself produces powerful, dense and ageworthy reds based on Tannat and often blended with a bit of Cabernets Franc and Sauvignon and Fer-Servadou. It was here that the technique of micro-oxygenation was developed to harness and soften the Tannat’s often aggressive and sturdy tannins. Some of the wines are world-class and provide very good value. 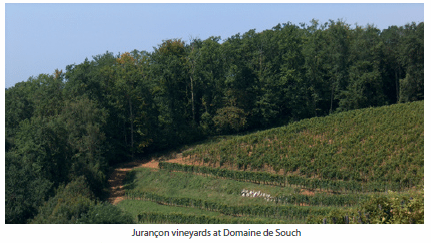 Jurançon is without doubt the finest white-wine appellation of the south-west. Gros and Petit Manseng as well as Petit Courbu are planted. The wines can be sublime, particularly the sweet styles. Yields are low and inevitably prices are rising. The reds of Béarn are generally light and insubstantial. To the south-west of Jurançon, nestled into the foothills of the Pyrenees, Irouléguy provides good reds and whites from the same varieties as Madiran and Jurançon.